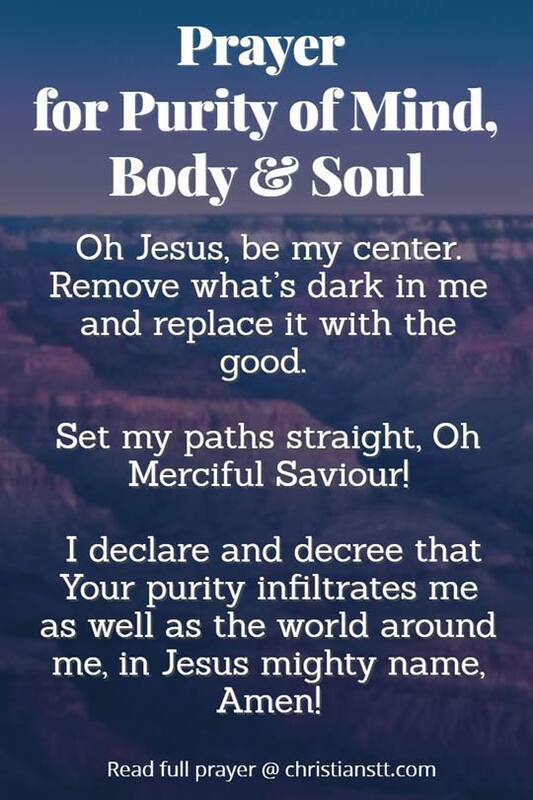 Prayer for Purity of Mind, Body and Soul. Heavenly Father, I come before You today, requesting that You cleanse me of anything that breaks Your heart. Purify my mind, body, and soul. Help me to seek righteousness above all else and not stray into the temptations of the world. Push me forward to be a leader and to set an example for the generations to come. Philippians 1:9-11 And it is my prayer that Your love may abound more and more, with knowledge and all discernment, so that You may approve what is excellent, and so be pure and blameless for the day of Christ, filled with the fruit of righteousness that comes through Jesus Christ, to the glory and praise of God.